Greeley’s Chris Melis drives to the basket in last Thursday’s season-opening win over Carmel. Fans attending Thursday night’s season-opening game for the Horace Greeley boys’ basketball team could not have helped noticing the gym’s two spectacular new scoreboards. They also couldn’t have missed the brand new player in the host Quakers’ starting lineup. Nick Townsend, a 6-foot-5 freshman center, made his varsity debut and wasted little time providing a reminder of the past and a hint of the future. He grabbed his first rebound less than 15 seconds after the opening tip and finished the evening with 11 of them, to go along with 13 points, as the new-look Quakers cruised to a 69-48 victory over the Carmel Rams. 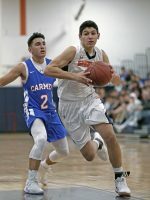 “He’s going to create his own reputation and he’s gonna create his own game,” said Greeley head coach Felix Nicodemo after watching Townsend replicate some of the interior dominance his much older brother Matt supplied the Quakers with for four years before leaving as the school’s all-time leading scorer and rebounder. One of those guys figures to be Christoph Sauerborn, a junior guard who also dazzled in his varsity debut by connecting on four 3-pointers during a three-and-a-half minute, 14-2 Greeley blitz in the first quarter that opened up a whopping 26-7 lead against the overwhelmed Rams. Carmel did manage to cut its huge deficit down to seven points late in the opening half, but never got any closer than eight after halftime. The Quakers began the night by scoring the game’s first seven points and never looked back. Their star junior forward, Chris Melis, who wound up with a game-high 23 points, provided an early highlight when he drove the left baseline and finished with a two-handed dunk that stretched Greeley’s advantage to 12-2 just two and a half minutes into the contest. Soon after, the Quakers ran off 11 straight points, nine of them coming from the hot shooting of Sauerborn from beyond the arc and the other two on the first basket of Townsend’s career, a little flip in the lane that Greeley fans are sure to see plenty more of in the years to come. Sauerborn’s final 3-pointer of the game, with three and a half minutes left in the half, gave the Quakers a 31-17 lead, but by halftime Carmel had closed to within 38-29. Melis, now the leader of the Quakers with the graduation of three-fifths of the starting lineup from last year’s team that advanced to the sectional semifinals, had 15 first-half points. He erupted for four baskets in the third quarter, and Townsend added six points as Greeley outscored the Rams 16-10 to build a 15-point cushion heading to the final period. Crunch time never arrived against the Rams in the fourth quarter because of an 11-0 Quaker spurt that built a 67-44 lead with just under two minutes remaining. Senior guard Noah Shar had eight of the points during the big run, in just over a minute, as he made back-to-back 3-pointers and then added a lefty toss in the lane. Nicodemo was no doubt satisfied with what he saw from his team on opening night, but what about those new state-of-the-art scoreboards that commanded everyone’s attention and at times bewildered the crew trying to control it at the scorers’ table?